During the Second World War, a labor shortage developed as men began to serve in the armed forces. 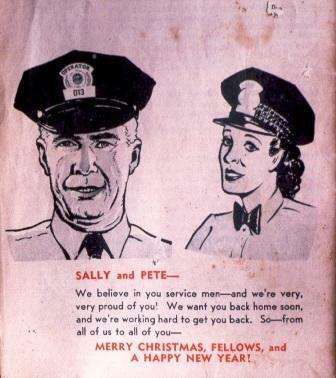 Women were increasingly encouraged to take over responsibilities on the home front. Women took jobs of all types: skilled and unskilled, manual and office. While men served overseas, women assumed support roles in the military and worked in various defense plants. Though not as celebrated, women also worked in one of the city's most visible industries. 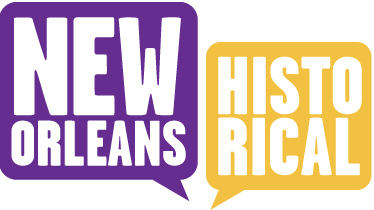 From 1943 through early 1946, more than two hundred females from rural areas throughout the South as well as New Orleans neighborhoods worked on the streetcars. Positions with New Orleans Public Service, Inc. (NOPSI) paid significantly higher wages than the drug store and retail clerk positions typically afforded women. NOPSI trained the women alongside male recruits, and each woman was responsible for the same duties: operating the cars and performing impromptu maintenance; collecting transit fares; keeping the cars on schedule; and enforcing racial segregation within the transit vehicles. In Southern cities, African-American males were never considered for employment as transit operators. Monitoring and adjusting the race screen proved to be the most difficult part of their job. Despite protests from the NAACP, federal officials refused to suspend the practice of racial segregation in the city. In many instances, white as well as black soldiers and sailors who had trained at bases throughout the South chafed at the Jim Crow requirement as they passed through the city on their way overseas. Soldiers often threw the "race screen" signs out of the windows. Military Police and New Orleans Police officers provided support for the women operators and arrested soldiers who protested the practice. Once the men returned, the women were required to leave their positions. Most were informed when they showed up to work their shifts. Many were upset to see newly returned military veterans -- not just former transit operators -- assuming these jobs. The last women were released by February 1946. Some women transitioned into other jobs while many returned to household work. Transit company documents suggest that women earned the same rate of pay as men, but many of the women report being paid a bit less than the men, presumably to placate their male co-workers. Fifty years later during a 1993 reunion of the operators, a woman named Anna was celebrated because she had refused to "give up her badge" until threatened with arrest. Women would not serve as streetcar operators again until the mid-1970s, following advances made by the Civil Rights and Women's Rights movements. Images are from the private collections of the late Mary Fischer, New Orleans' first woman transit operator, and the late Albert McCloskey Browne, former streetcar conductor, bus operator and accident claims investigator. 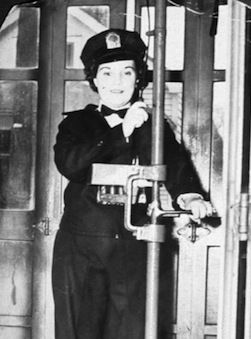 Mary Fischer, 1943, First Woman Transit Operator: To increase the likelihood that the male employees would accept the women, the company first announced that only the wives of transit employees serving in the military would be hired. While Mary Fischer was celebrated as a pioneer at home, her husband, Arthur Fischer, responded to the news by insisting that she not take the job. 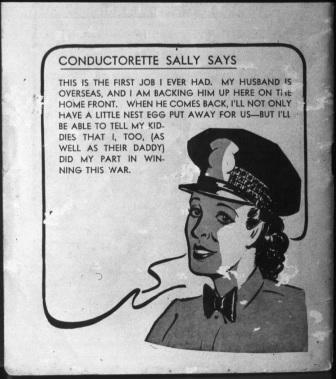 Conductorette Sally: A regular feature of the employee newsletter, "Conductorette Sally" provided advice for women operators and helped to emphasize that women operators were doing their part to aid the war effort. NOPSI's Newsletter to Military Servicemen: Company managers mailed copies of the transit division newsletter to its male employees serving in the military. 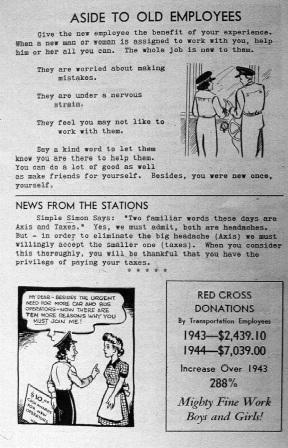 The letters section of the newsletter regularly included grateful acknowledgements from the servicemen, many of whom specifically thanked the women operators for serving in their place. Aside to Old Employees: While the text does not specify gender, the illustration depicts a motorman instructing a "motorette." 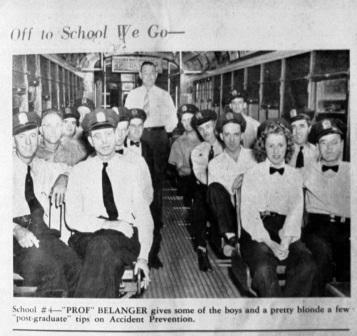 Accident Prevention: During World War II, NOPSI developed its first training school and began to provide classroom instruction as well as the traditional experience of working with veteran employees on buses and streetcars. The advent of women operators followed a period of high employee turnover. Higher pay in the defense industry induced many transit employees to abandon bus and streetcar work. Working with less experienced employees, transit officials redoubled efforts to reduce employee and passenger accidents on the city’s overcrowded busses and streetcars. Note the manner in which the newsletter editor identifies the only woman in the group. Michael Mizell-Nelson, “WWII Conductorettes and Motorettes,” New Orleans Historical, accessed April 19, 2019, https://neworleanshistorical.org/items/show/492.